Truth be told, there’s nothing easier then booking trains with a travel agent — because guess what: they do all the grunt work for you. We’ve booked more trains than we can count, because there’s nothing like a train to epitomize the essence of old world travel – elegance, luxury, slowness, deliberateness. It takes everything that’s delicious and romantic about travel and wraps it all in a choo-choo package. Then there are the rarer, specialized trains like the luxury Palace on Wheels in India and the 3-Day Spirit of the Andes in Ecuador, the futuristic Shikishima in Japan and the sleek Rovos Rail from Cape Town to Dar Es Salaam in Tanzania. At WIT, our agents even book overnight sleepers from Chicago, tickets from Montreal to New York with Amtrak and trans-Canada routes on VIA Rail that go from coast to coast and sometimes bring you head to head with a polar bear (thank you Churchill). There’s even the Trans-Siberian tours by the MIR Corporation, that speeds through the heart of Siberia and branches out to Eastern Europe, Central Asia and China. Did somebody say the Silk Road? So what are you waiting for? Whether you want a train journey in the forefront of your vacation, or it’s merely a luxurious point A to point B situation – there’s only one way to Book a Train with a Travel Agent: Call us today! 503-224-0180 or email info@wittravel.com. All Aboard! In Portland this December? 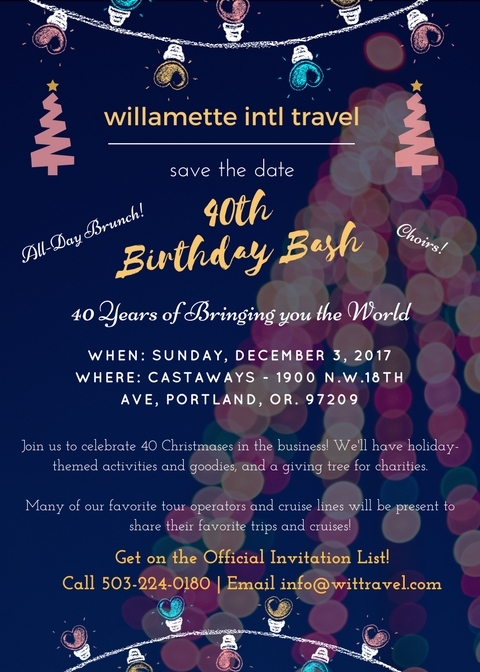 Join us Dec. 3, 2017 at Castaways, 1900 NW 18th Ave. for our 40th Birthday Bash and meet many of our awesome vendors, including a few who specialize in trains!